I first heard about this book, coincidentally, on the day it released. I saw the US cover with the confetti and it had me intrigued. 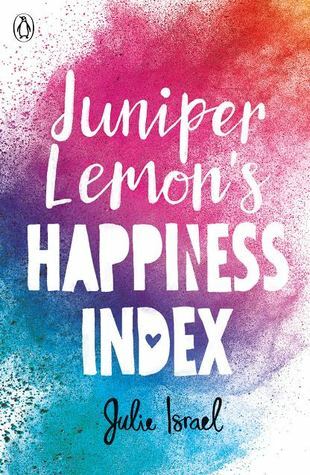 Then one day, as I was doing my weekly (okay, daily) Amazon sweeps for new books releasing in India and great deals on slightly older ones, I came across the pre-order button for Juniper Lemon’s Happiness Index and I was OVERJOYED to see that it was being releases here – and with an EVEN prettier UK cover! I dove into this book a few days ago, and it’s been a rollercoaster. There was so much to feel, so much happiness and friendship and love and a little but that annoyed me too, but I’ll take it with the flow. 1. First things first, THAT COVER IS ABSOLUTELY STUNNING. It’s a simple watercolour design with these small indented spray marks that you can only see when you hold and I ABSOLUTELY love it. It’s simple and GORGEOUS. 2. The second thing I LOVED about this book was Brand Sayers. He’s the love interest (if me squealing on Goodreads didn’t already inform you of that) and he’s a “bad boy” with a sarcastic side, one who adores gummy bears, is the broody lead singer of a band and calls Juniper “Lemon”. I absolutely loved scenes with him in them and it’s been a while since I liked a contemporary boy THIS much! 4. I think I’m a little upset with the fact that Juniper’s talk with the best friend who stopped talking to her right after her sister died wasn’t actually a scene in the book but mentioned as an afterthought. I would have loved to have seen them talk it out, considering their history but it just felt so… rushed. 5. Another thing I loved was Juniper’s method of thinking that everyone around her was YOU, the man that her sister was secretly in love with. It got tedious after a while, though, and after looking for YOU for a whole book, I feel like we didn’t get the conclusion we deserved. It was left as an open ending with nobody to pin all the love on. HOW AM I SUPPOSED TO GET CLOSURE? 6. The thing I LOVED the most about this book was Juniper’s art and how she used it to remember her sister. I’m in a design course in college and so this resonated with me and I loved it SO SO MUCH. Would I recommend this book? Yes. It has it’s downsides but a) IT’S SO PRETTY TO LOOK AT and b) it has some PRETTY great moments too. A tale on friendship, love and moving on after the person you thought the world of is lost to you forever. 3.5 stars. Je suis Julie. I hold a B.A. in Creative Writing but am prouder of things like my by-the-seat-of-the-pants experience teaching English in Japan, self-taught progress with guitar and liquid eyeliner, my pursuit of languages and delicious words: relámpago, お花見, maquillage. I’ve been an artist since I could mar walls with crayon and a writer since grade-school parodies, but chose to study writing because I thought I’d have a better chance landing a job with it (Oh, my sweet summer self). I’m now pursuing my dreams with reckless abandon: noveling first, making art on the side. Repped by Susan Hawk of Upstart Crow Literary. My first book, JUNIPER LEMON'S HAPPINESS INDEX, will be out May 30th, 2017 with Kathy Dawson Books/Penguin. Have you had the chance to read Juniper Lemon's Happiness Index? What did you think of it? What are some of the best young adult books that deal with loss?